Introducing SQL Information Protection for Azure SQL Database and on-premises SQL Server! We are delighted to announce the public preview of SQL Information Protection, introducing advanced capabilities built into Azure SQL Database for discovering, classifying, labeling, and protecting the sensitive data in your databases. Similar capabilities are also being introduced for on-premises SQL Server via SQL Server Management Studio. Helping meet data privacy standards and regulatory compliance requirements, such as GDPR. Data-centric security scenarios, such as monitoring (auditing) and alerting on anomalous access to sensitive data. Controlling access to and hardening the security of databases containing highly sensitive data. What is SQL Information Protection? Discovery and recommendations – The classification engine scans your database and identifies columns containing potentially sensitive data. 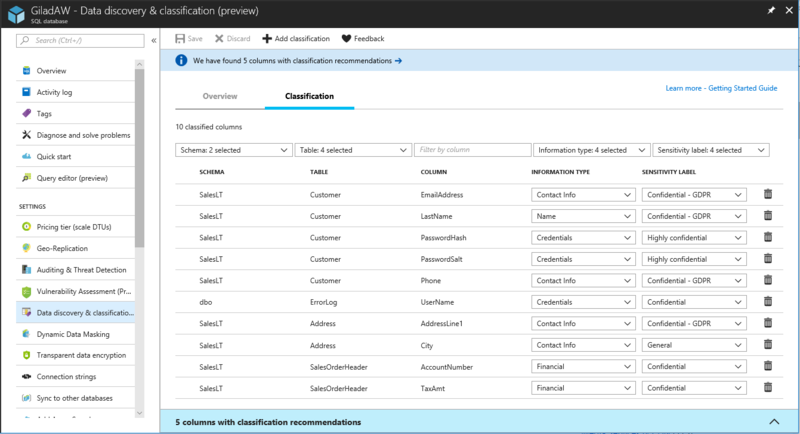 It then provides you an easy way to review and apply the appropriate classification recommendations via the Azure portal. Labeling – Sensitivity classification labels can be persistently tagged on columns using new classification metadata attributes introduced into the SQL engine. This metadata can then be utilized for advanced sensitivity-based auditing and protection scenarios. 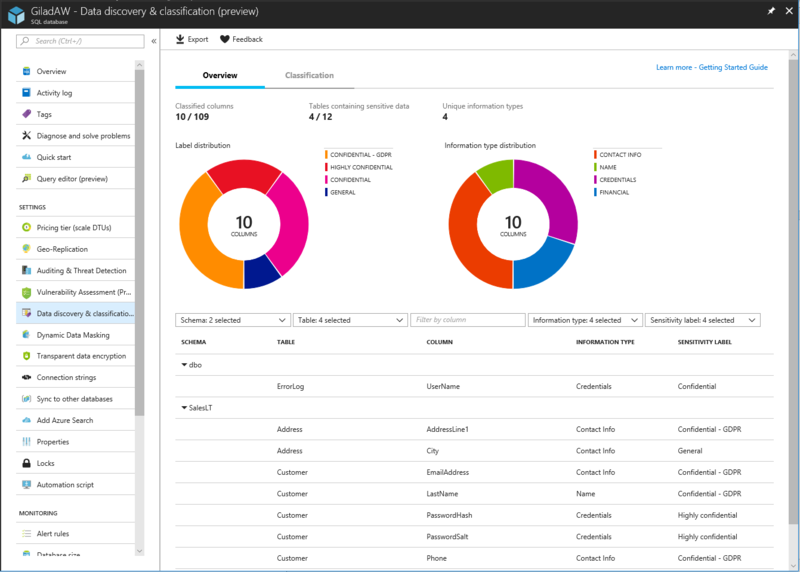 Monitoring/Auditing – Sensitivity of the query result set is calculated in real time and used for auditing access to sensitive data (currently in Azure SQL DB only). Visibility - The database classification state can be viewed in a detailed dashboard in the portal. Additionally, you can download a report, in Excel format, to be used for compliance and auditing purposes, as well as other needs. Additional SQL IP capabilities will continue rolling out throughout 2018 – Stay tuned! How does SQL Information Protection work? We designed SQL IP with the goal of streamlining the process of discovering, classifying, and labeling sensitive data in your database environment. Our built-in automated classification engine identifies columns containing potentially sensitive data, and provides a list of classification recommendations, which can be easily applied as sensitivity metadata on top of columns, using new column sensitivity attributes that have been added to the SQL engine. You can also manually classify and label your columns. We encourage you to try out SQL Information Protection today for improved visibility into your database environment, as well as for monitoring access to your sensitive data.